Today I covered another stretch of Lakeville Highway in the Petaluma area. Most of this area is pastureland and vineyards. 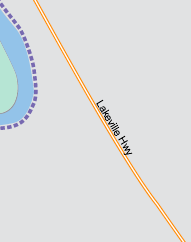 What is not shown on the map (right), is the option to take Old Lakeville Road #3 -- a road that roughly parallels the highway, and is a much more pleasant walk, with much less traffic, more trees (and shade), and interesting birds and animals as well. I saw two owls up in some tall trees (pictured); and, later on, some llamas in a pasture south of Sleepy Hollow Dairy. I was relieved that no farm dogs ran out to "greet" me. Animals (and cars) are not used to seeing pedestrians on this stretch of road. The weather is starting to feel more like summer. I stopped at Ernie's Tin Bar on the way home to buy a bottle of orange soda. I'm not normally a soda drinker, but I was thirsty. And it was a fun place to visit. They told me there were some eagles in the area. I was sure I had heard an eagle on my walk, but didn't see it. Only hawks and turkey vultures, and owls. There were lots of birds in the tall rows of eucalyptus trees that lined the roads; however, it was difficult to actually see the birds in these large trees. Today's short walk commenced with lunch at Papa's Taverna (next to Lakeville Marina). It was a beautiful day, and Papa's restaurant dining area had a great view of boats on the Petaluma River. Downstairs from where I ate, was an area for live music and dancing, and a bar. It looked like a fun place. After lunch, and a look around the Taverna, I walked South on Lakeville Highway, until I turned around .9 mi. later, at 6210 Lakeville Highway. On the way, I passed the Keller Estate (winery), and pastureland. Most of the walk was in direct sun, but there were a few places with shade from some large trees. The first lizard I saw today (shown) had a forked tail, which was interesting. Not much else to report on the wildlife front. In the distance there were horses and cows grazing. On the trail at last, after taking a few minutes to find where we were going. This trail appears to end in the middle of this stretch of trail. If you're walking from north to south, be persistent and you'll find it continues south of the boat launching area. Thank you to Margaret and Albert for joining me on this walk. We had a few lizards dart away from us into the dry grass on the edge of the trail; most of the other wildlife consisted of birds, particularly red-winged blackbirds and swallows. There were some interesting, picture-worthy clouds today. And there was enough open space by the park and river to capture some interesting cloud pictures. We passed a remote-controlled plane flying area; and a ball field. It was interesting to see a BMX biking/racing area at the southern end of this trail by the golf course. While the BMX course was closed when we walked by, the dirt hills and other features were visible through the wire fence. We also passed a tree (shown) by the river that was loaded down with more pine cones than any other tree I remember seeing before. Although it's hard to see the cones in this tiny picture. Maybe it was just the species of tree. Albert (dog pictured at right) was a great bay trail walker. 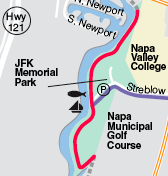 some confusion about recent changes in the downtown Napa River landscape, and a question about whether those changes were reflected in the Bay Trail map, it was interesting to see the new buildings and new concrete pathway along the Napa River. After having a light lunch (at the Sweetie Pie Bakery on Main Street), we walked north along the river, under the 3rd Street bridge (I think); however, we were apparently going too far north to intersect with the Bay Trail on our maps. Fortunately, even with the construction along the river this past year, the duck population down by the river banks seemed pretty healthy, with an impressive number of ducklings as well. 40 swallows; 59 ducks (including 10 ducklings); 2 crows; and 1 sea gull. Technically, the Bay Trail does not extend all the way up to the historic downtown portion of Sonoma, but I decided to make an extension trip. After my brush with farm dogs on Arnold Drive earlier this evening, I decided to treat myself to some relaxing time in downtown historic Sonoma. It was a beautiful warm night, a perfect time to stroll around Sonoma Historic Plaza and through the Park, and to see Mission Sonoma. Although the Mission had closed for the evening, there was a very photogenic cactus in bloom in front. Pretend cows at "The Chocolate Cow"; white ducks in the park and the pond; and a possible bat flying over at dusk. This evening marked a return to walking on more rural highways, with fast-moving traffic, and moderate shoulders on the side of the road. Like many of these roads in the Bay Trail system (depicted on the Bay Trail maps by double yellow lines), this is not a route for families, children, or dogs. and Bonneau Road (Highway 121) had an overabundance of aggressive farm dogs who were able to run out into the road, so I would not recommend this segment for pedestrians of any kind. And if you're on a bicycle, with luck you can outrun these dogs. Unfortunately, these dogs (all on the West side of the road) caused me to have to cut this segment short; so I will have to make up this last stretch sometime later. Note: this is the first time I have encountered any problem with dogs in more than 200 miles of walking. Fingers crossed it will be the last. I was able to walk south on Arnold Drive from East Bonness Rd., and reached the intersection of Arnold with Bonneau Road, before turning around and walking back to my car. Further down E. Bonness Rd., in the distance, was a very tall tree, being used as a flag pole, for a very large American flag. It was impressive for its size. 14 blackbirds; 2 swallows; 6 barking farm dogs (in 3 different places); 2 red-winged blackbirds; 4 horses; 12 cows; 2 lizards; 1 bluejay; 2 rusty screws; 1 little brown job (LBJ). This tiny segment of Bay Trail map (at right) is not really helpful in describing where this make-up walk (of a missed segment) took place. These double yellow lines are meant to represent a stretch of Arnold Drive -- between Almeria Drive and Mission Drive. Yesterday, I mistakenly saw a Temelec neighborhood sign (at Almeria Drive) and thought I had reached the point where I'd left off yesterday (Mission Drive). Both streets had the same Temelec signs facing Arnold Drive. Anyway, I walked north along Arnold Drive, and walked back/south on Temelec Circle. The Temelec development looked like it had been planned, perhaps in the 1950s or 1960s. It included different types of housing units. It looked peaceful, and in some ways frozen in time. Where I live, older houses from this era are being made-over and ripped down, being replaced by multi-story, high-density housing. While there are crows and squirrels in the suburbs where I live, lizards and many other wildlife species have vanished. Tonight was a pleasant evening to walk. As I made my way down Leveroni Rd. (heading East), the rural feel and vineyards gradually shifted to a more developed area. I was happy to see some sidewalks again, after teetering on the edge of country roads -- between the traffic rushing by on one side, and dry grass and brush on the other side. I passed by Tex Juen Park and Vineyard with lavender bushes loaded with purple flowers, and the intersection of Leveroni Rd. and Broadway. The buildings were attractive, designed with mission-style architecture. The Salsa Trading Post had a mission bell on a pole, used to mark El Camino Real (the royal road). A nice crescent moon was rising in the background. I walked until the sidewalk disappeared and it became rural again, and it was so dark (no streetlights) I could no longer see where I was walking. Some of the last things I saw included a cow-shaped fund-raising sign, and an "eggs for sale" sign. 14 little brown jobs (LBJs); 5 swallows; 1 cloud of bugs near Sonoma Creek -- then it got dark, and I didn't see anything else. This evening was pleasant, although a big muggy. The birds were very quiet, in the trees. I walked South from Felder Road to the Temelec neighborhood, to Almeria Drive. (I later realized I should have walked back to a similar street (Mission Drive) with a similar Temelec sign; so I walked that missed segment the next day.) I then turned around and walked back on Arnold, making a right on Leveroni, and continuing on Leveroni Road until I reached two mailboxes near the entrance gate to a dairy farm. Tonight was a very pleasant evening for walking. 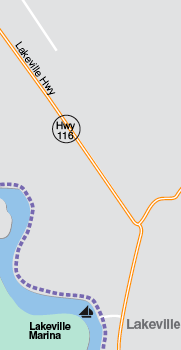 I walked out to 116 East (Stage Gulch Rd.) and proceeded West. However, soon the road narrowed and the shoulder walking area disappeared (plus there were construction barriers which made walking impossible further West). So I turned around at Champlin Creek Road, and headed the other direction, to the intersection of 116 East with Arnold Drive. I turned left on Arnold, and enjoyed seeing fields and tractors across the street. I walked as far as Mission Drive (Temelec), and then turned around to walk back to car, via the other leg of Watmaugh Road. My favorite part of the walk was seeing quail running in fits and starts along the ground -- trying to stay out of view behind trees. I hadn't seen any quail for months. While they are more common in the North Bay, I don't see them where I live. I also felt I was really in the country when I read the eggs for sale signs in the area. I really do enjoy walking. But, this evening's walk was mildly terrifying. In addition to walking on a narrow shoulder of Highway 116 (shown as yellow lines on map, right) with traffic whizzing by, and occasionally getting buffeted by blasts of air from passing semis, I also had several surprise encounters with wildlife. First, I stepped too close to (what I'm guessing was) a gopher snake that was lying at the road's edge; it immediately coiled into a defensive posture (right). Most of the snakes by the side of the road I've seen have been dead. I was happy to see this one was alive, but it did give me a start. I also had a cow run toward a fence at me. It looked like this cow was either trying to chase me off, or that it was extremely frisky and wanted to play. (Picture shown at right of cows was taken a few seconds before this happened.) I wasn't willing to risk having this animated cow burst through the fence on my account; so I quickly crossed the street. Last, but not least, as the sun went down, the afternoon breeze died down -- enabling a large army of mosquitos to move around comfortably. A cloud of bugs encased me for almost 2/3 mile. It was then that I looked forward to every blast of air from those passing trucks -- to blow the bug cloud off me. Thank you to the two (separate) women who stopped to see if I was in trouble or needed a ride. I really appreciated their kindness. It was hard to explain to them -- as I was swatting away mosquitos, and trying not to swallow any -- that, really, I was out walking of my own free will. Swat, swat, cough. No really, I do this for fun. Before the bugs almost carried me off, I enjoyed watching a "V" formation of Canada geese flying overhead (shown in tiny picture, right) seeing the golden-pink tones of the evening sunset, and hearing some frogs singing near a large pond in the distance. 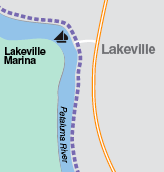 I did not have time to investigate the Lakeville Marina, near Papas Taverna, just off the highway. Maybe next time. 4 sheep; 10 blackbirds (orioles? ); 20 red-winged blackbirds; 21 swallows; 4 little brown jobs (LBJs); 1 rusty screw; 23 Canada geese (flying in V formation overhead); 62 cows; 3 snakes -- 1 live (brown-patterned) snake, and 2 dead ones (1 brown-patterned, 1 kingsnake); 2 crows; and one gigantic cloud of mosquitos (almost 2/3 mile long).